People don’t take trips – trips take people. Saturday, January 18 through Sunday, January 26, 2014-Desert Eagle RV Park on Nellis AFB, Nevada: Well, we are happily still in Las Vegas and currently plan on staying for another week or two. 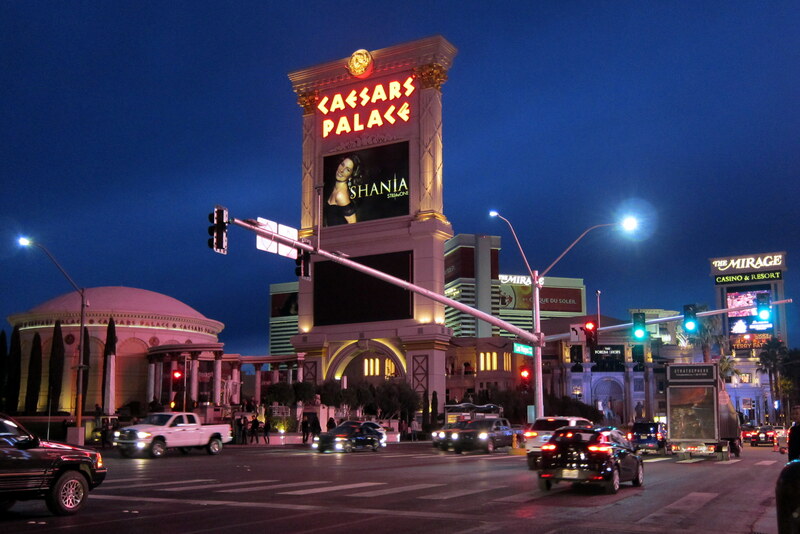 Historically, our stays in the Las Vegas area run three to four weeks. However since we left home earlier this trip, we have additional time to enjoy being on the road before heading back home to experience both weeks of summer, or as Mainers call it…..two weeks of pretty bad skiing! So we decided to spend some of that bonus time here in Vegas since Jack and Tucker are growing very fast and we are having a blast hanging out with them. And, at least for now, they appear to be having a blast hanging out with us! 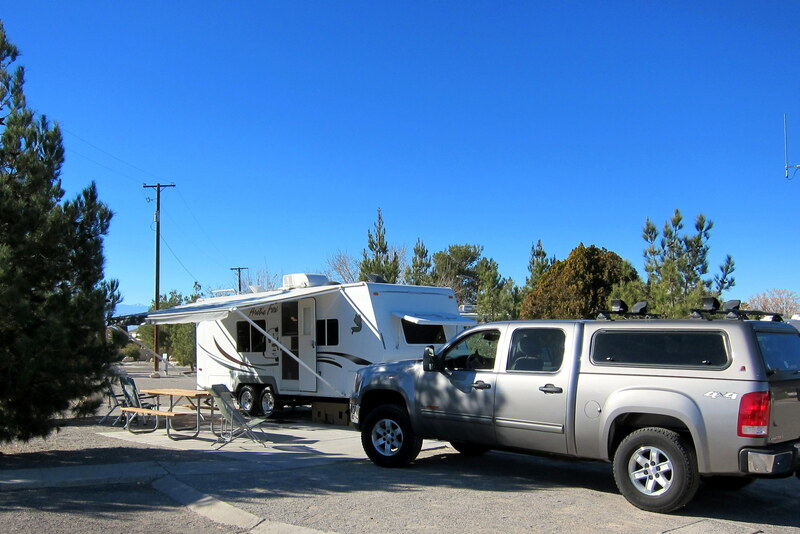 As mentioned previously, we have a real nice campsite at Desert Eagle RV Park. Full hook up’s with a strong Wi-Fi signal. However, when the retirees settle down to stream videos before their 2000 bedtime, the Wi-Fi slows to a crawl. No problem, we just fire up our Verizon Mi-Fi and all’s good in Cyberville. In addition we have some great neighbors, most of whom spend the winters here at Desert Eagle. Many are from Alaska or the northwestern states; however one couple we met resides in Florida…..not sure I understand that? Our next door neighbors, Mike and Karen, are from Omaha, Nebraska. And yes I did ask them, and no they do not know Warren Buffett! However Mike, following a 22 year career as a USAF Navigator, worked for the state agricultural department and used to regularly visit the Buffett family farm which is being run by Warren’s son, Howard. We were once again very fortunate to spend Saturday and Sunday with the grandkids and would usually embark on a weekly “Mystery Ride”. On one of these special road trips we landed at the brand new Children’s Discovery Museum, an incredible facility full of fun and educational interactive exhibits. 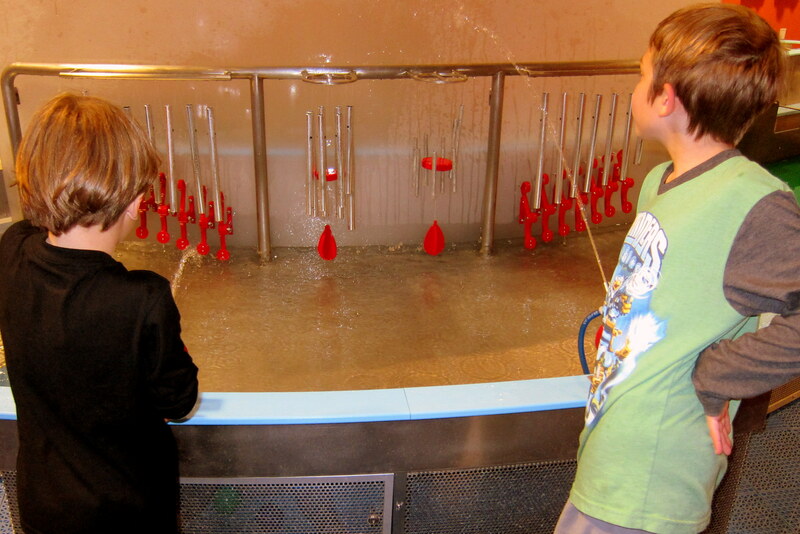 Even though the Children’s Discovery Museum has been open less than a year, this marked our second visit. The first coming on opening week during last year’s spring break and it was absolutely packed. We vowed to return and more thoroughly explore this highly enjoyable 58,000 square foot facility. A centerpiece (literally) of the museum is called “The Summit”, a 70 foot tall multi-level structure. This skeletal tower penetrates the museums three exhibit floors and eventually pierces the building’s roof leading the intrepid visitor to a glass bubbled observation area where 360 degree views of the Las Vegas Valley are enjoyed. Each level of The Summit tower features interactive displays in such diverse topics as, mechanical leverage, aerodynamics, light refraction, sound propagation, magnetism, electrical generation and fluid dynamics. 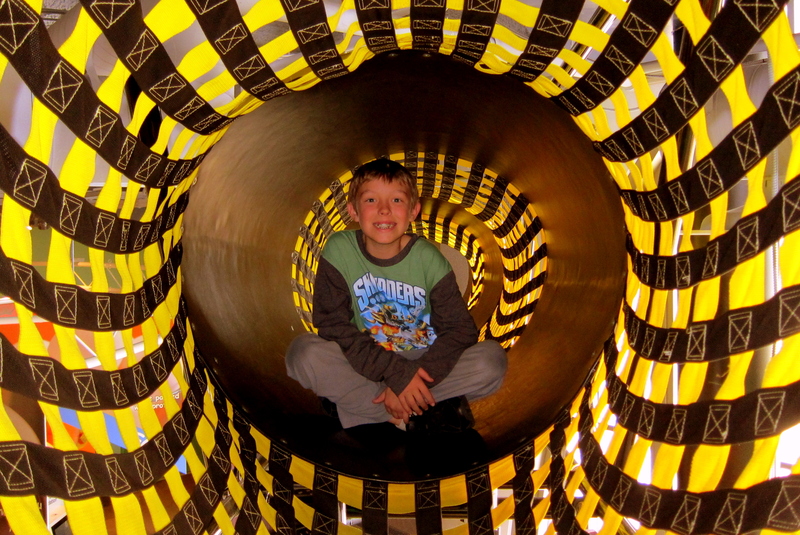 Moving from level to level within the tower is accomplished by way of tubes….. Very helpful and knowledgeable museum staff members are stationed on each level of the tower, most who appear to be college students. A strict requirement placed on adults by these folks is that a parent or guardian be in sight of their children at all times. This meant I moved from level to level within the tower by way of tubes and slides as well! 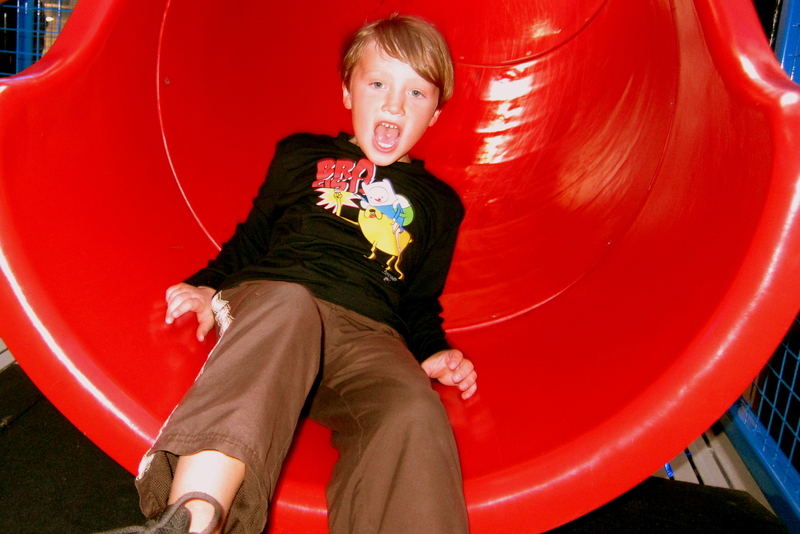 I did notice ladders for the more mature adults to use, but the tubes and slides were far more fun! 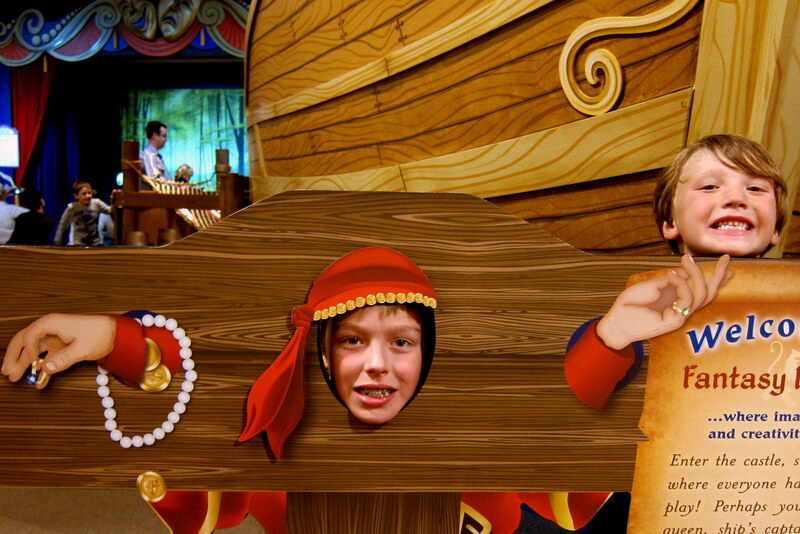 Yea, I know…..boys will be boys! 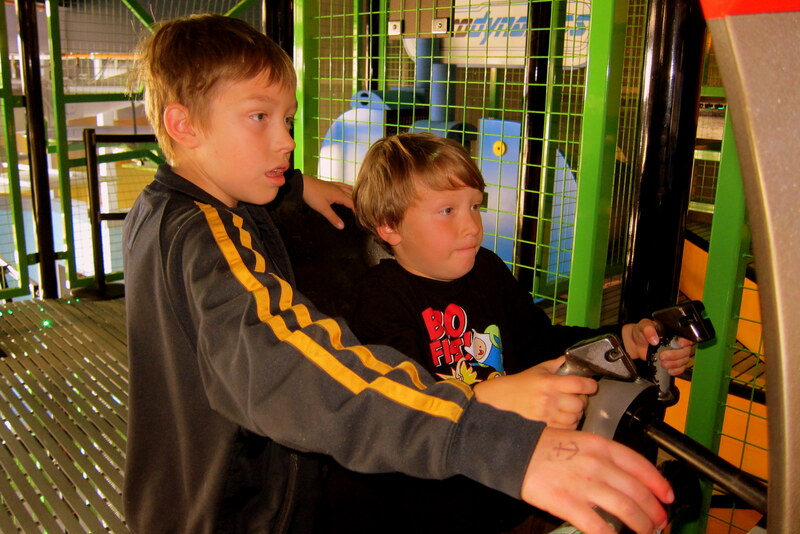 And transportation…..which featured a very realistic flight simulator. Notice the determination on the pilot and co-pilot’s facers as they prepare for a landing at the Las Vegas airport. Guma thought ahead and made a picnic lunch for us to enjoy. Consequently, the fun and learning was not interrupted for very long by mundane stuff such as eating. We spent over six hours at the museum and a great time was had by all! 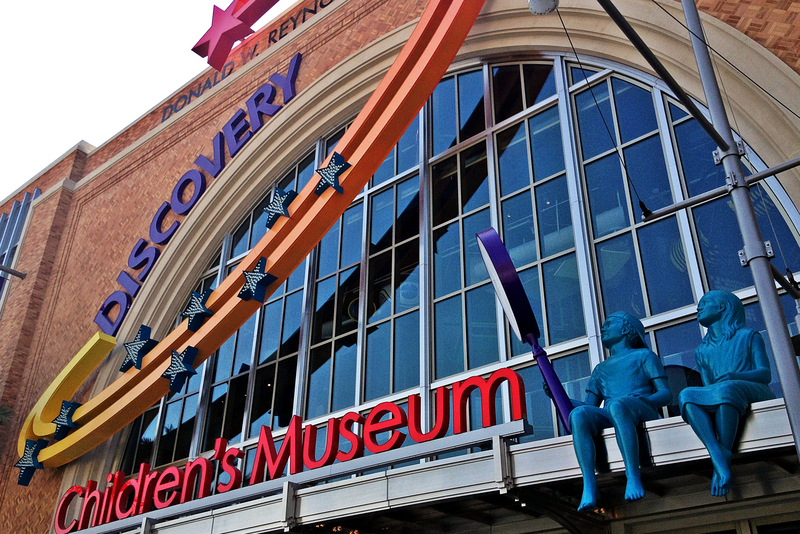 The Children’s Discovery Museum is located in a newly developed area near downtown called Symphony Park. 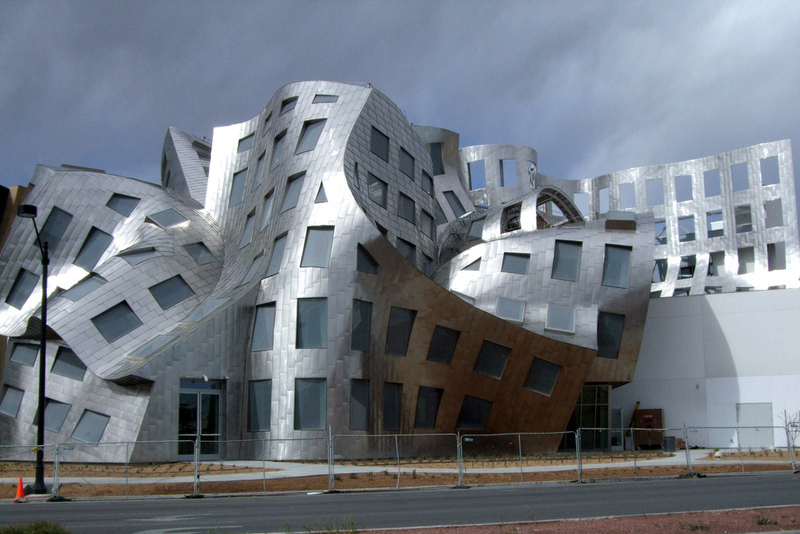 It features a number of business and performing arts venues as well as the world renowned Lou Ruvo Center for Brain Health. The fellow that designed this building most likely ended up having his skull examined within its walls. Kinda neat looking however…..like it melted and distorted in the hot desert sun. Part of the extra time spent in Vegas was consumed by the minutia of daily living. For example, we were able to place some Amazon Prime orders since the “Brown Santa” could easily find us and our mail-order medications could locate us as well. In addition, we were able to give the camper a thorough cleaning, inside and out and take care of rotating the trailer tires, filling the propane tanks, sanitizing the fresh water system, and performing a complete flushing of the wastewater holding tanks. Also, few items that had worn out or that had broken were either repaired or replaced. Having extra free time, we set a daily routine of sitting outside and reading followed by walking for an hour or so which racked up some serious steps on the Fit Bit’s. It was also an opportunity to get the truck tires rotated and the oil changed. 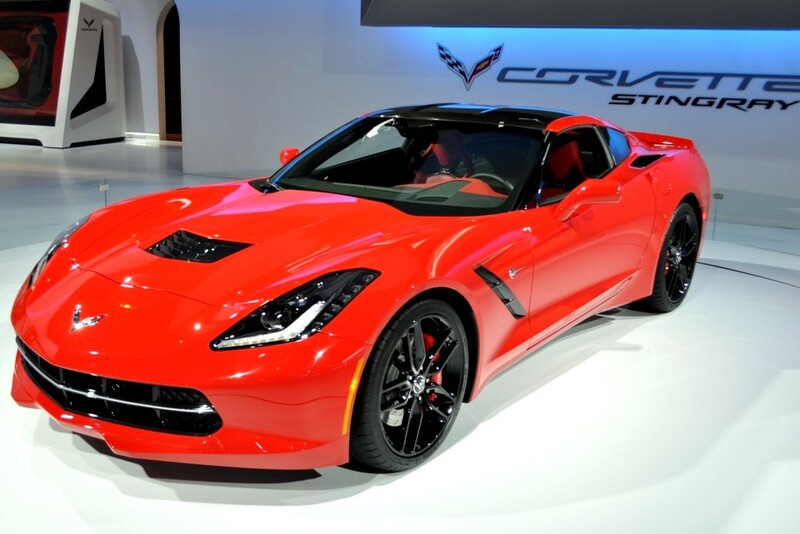 We used Ed Bozworth Chevrolet and while they performed the service work Kit and I enjoyed snacks and coffee in the very accommodating lounge while admiring the many brand new Corvette Stingrays they offered for sale. Well, I did…..Kit was more interested in a display of accessory running boards they offered for sale. In about an hour, our old truck came back expertly serviced at a very reasonable price…..they even washed and dried the old girl at no additional charge (the truck, not Kit). I was able to do some “toy” maintenance as well. As on past trips, my bike tires took a beating on the trails of Catalina State Park. Yep, double flatted…..again! While at the local bike shop I was whining about all the pointy things prevalent in the desert that find their way into my tires. The mechanic suggested tire strips and extra heavy duty tubes. Even though this protection adds an additional pound to an otherwise very lightweight bike, I think it will be worth it…..time will tell. 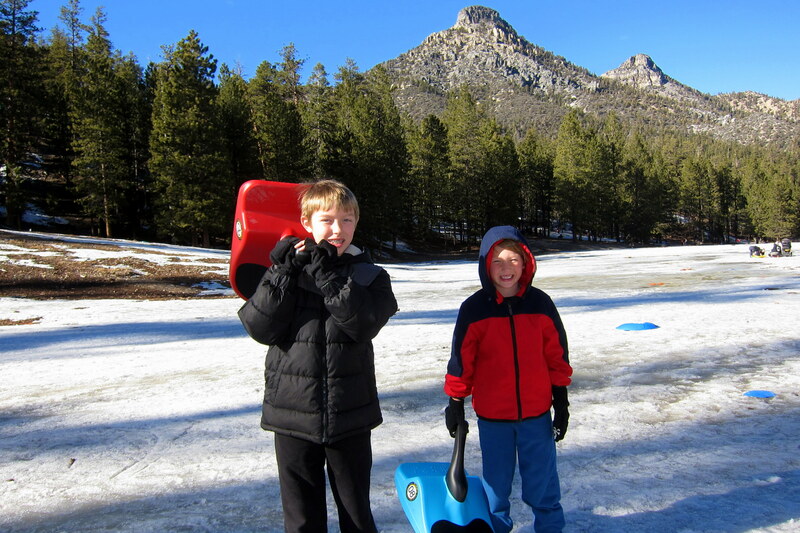 On one beautiful southwestern winter day we decided to visit Mount Charleston with Jack and Tucker in tow. 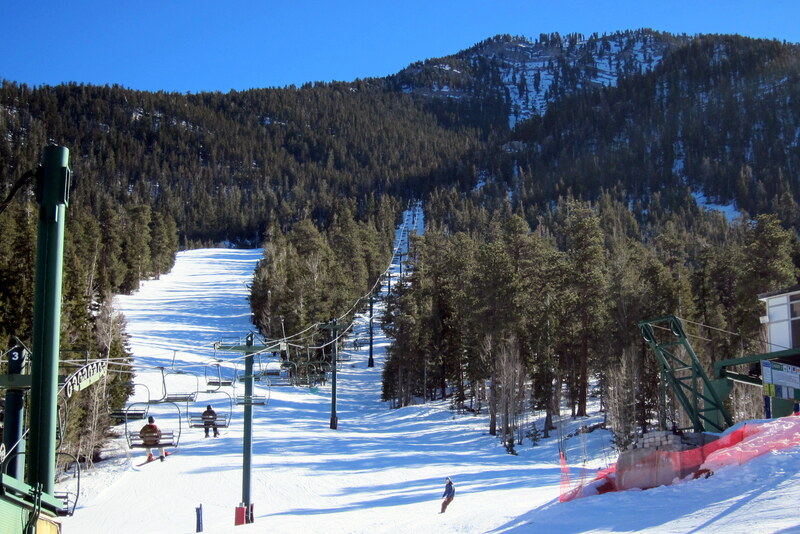 At 11,918 feet Mount Charleston is Nevada’s third highest peak and is only 35 miles from Las Vegas. 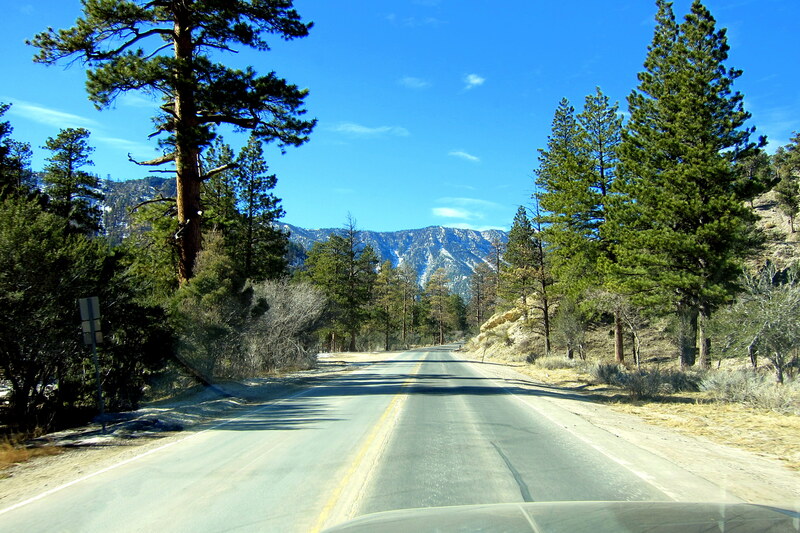 Being part of the Spring Mountain chain, Mount Charleston is within the Humbolt-Toiyabe National Forest. This local mountain is a year around getaway for folks both living in and visiting the Las Vegas Valley. 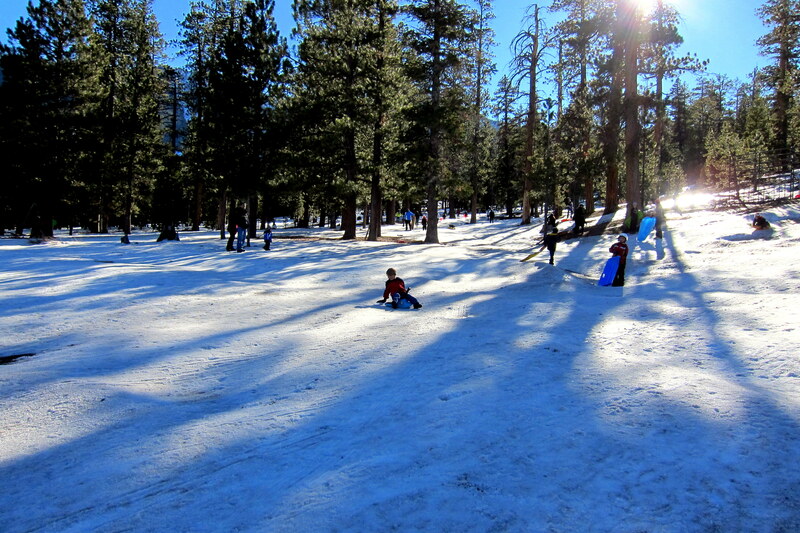 It provides both relief from summer heat and snow based recreation opportunities during the winter. Starting at 2000 feet, the road to this beautiful area meanders through the low desert where typical arid vegetation is prominent. 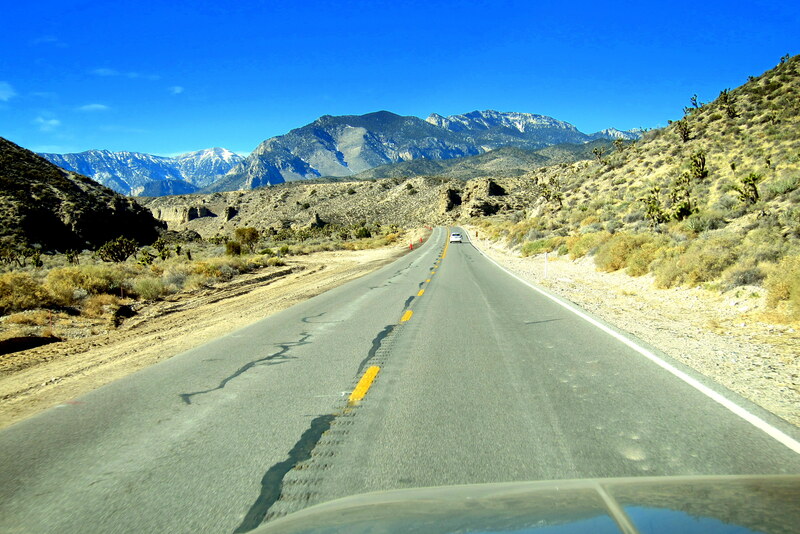 All during the ride up the access road, Mount Charleston remains prominently framed in the trucks windshield. The two lane road is very well maintained and appears to rise more gradually than most mountain roads. Passing 4,000 feet the road steadily climbs skyward and the landscape changes to more typical mountain terrain and vegetation. Soon we find ourselves at 6,940 feet and notice our first traces of snow. 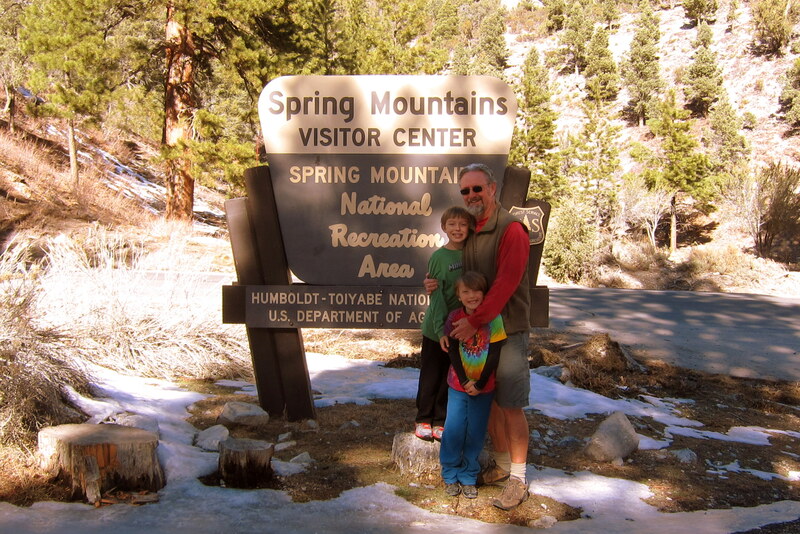 We make a stop at the Spring Mountains Visitor Center to pick up a map and some travel information. The current temperature, a very pleasant 55 degrees, is cooler at this altitude than down in the valley. At 9,515 feet we are nearing the summit and soon arrive at the Las Vegas Ski and Snowboard Resort. With only eleven runs serviced by three lifts it’s not a big mountain by any measure. However the resort features a nice café and lounge with outdoor seating and a very personable and helpful staff. 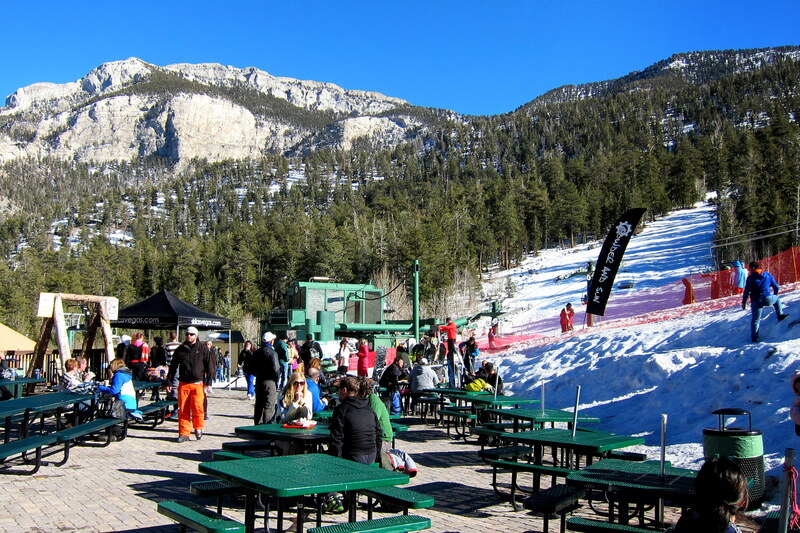 There are a very few ski areas where one can enjoy spring like skiing in January! At this altitude there can be as much as 200 inches of snowfall a year……but as a precaution, there is an extensive snowmaking system at the ready. While watching the skiers and riders ricochet down the mountain we enjoyed a great meal of cheeseburgers and fried chicken along with some of the best french fries around. The tab for this excellent meal was very reasonable, unusual for a ski area. Another difference from most other ski mountains is that beginner lessons are provided free…..all you have to pay for is a lift ticket and rental equipment. With full bellies we climbed back in the truck and went searching for a nice sledding hill. In just a few miles we came upon a number of vehicles parked alongside the road and noticed kids slipping and sliding down an adjacent hillside. 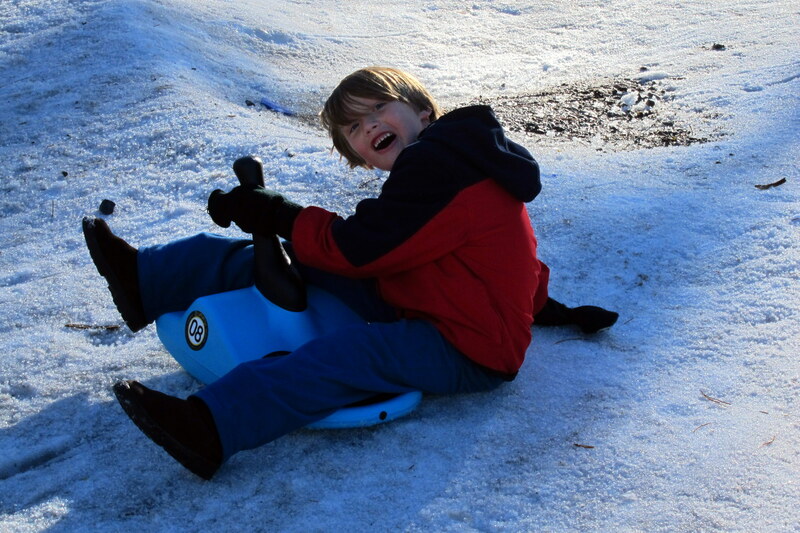 Jack and Tucker were quick to suit up in appropriate clothing, grab their Mini-Luge’s and scramble up the hill. I stationed myself at the bottom of the hill with camera at the ready. I remained vigilant at my rather vulnerable post and prepared to spring out of the way every time a careening grandchild tried to play human bowling with my 66 year old body. Fortunately, in over 50 some odd runs down the hill, I was able to zig as they zagged. Jack and Tucker enjoyed a great day of playing in the snow and I captured some fairly acceptable photos! 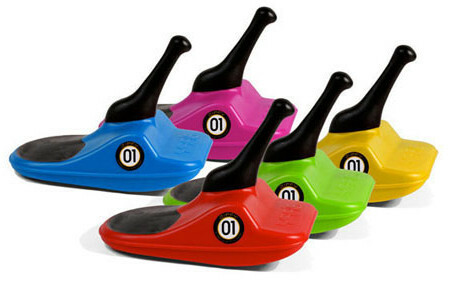 The devices the boys were “piloting” down the mountainside were called Freestyle Mini Luge Snow Sled’s. And they are available through Amazon. If you have kids or grandkids, order these snow rockets…..you will suddenly become their new superhero! The drive back to the campground was serene and peaceful as there were two very tired and happy little boys strapped into the rear seats. A fantastic day of enjoying another of the great entertainment opportunities one can experience if they just pry themselves away from the Las Vegas Strip. 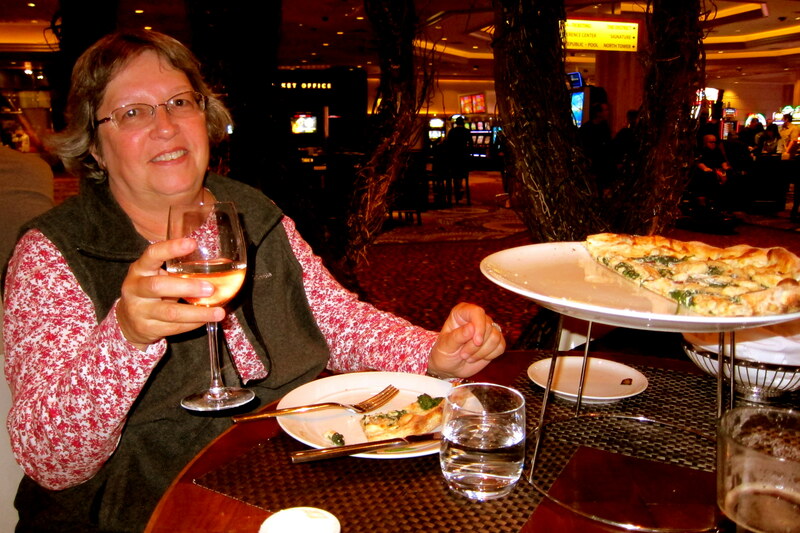 Speaking of which, Kit and I make at least one pilgrimage a year to Las Vegas Boulevard to take in a show, have a nice meal and watch all the crazies mill about. 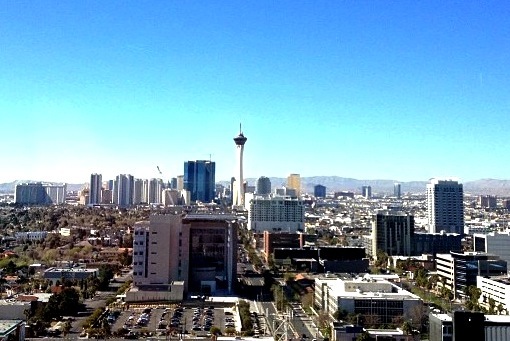 On these adventures we usually walk, however the distances up and down the strip can be deceiving. It is about four miles from the Mandalay Bay to the Stratosphere, and not all in a straight line. A lot of the sidewalks along Las Vegas Boulevard undulate toward the major casinos, depositing a tired, and thirsty, walker right in front of the main entrance. 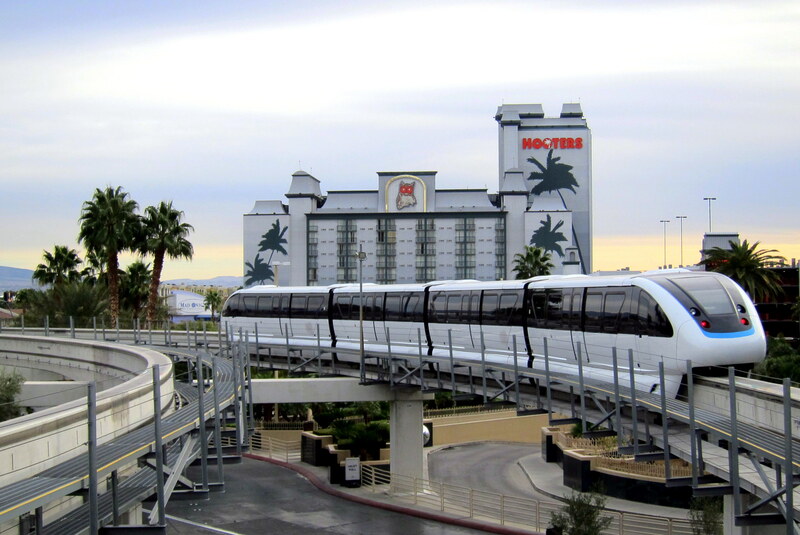 So a great way to travel about in comfort is by way of the Las Vegas Monorail. Since our planned destinations were miles apart we decided to take advantage of this service. An all-day ticket allows one to hop on and off at will and the trains arrive at any given station about every 6 minutes or so. In addition you have a great view of the “backside” of the strip and can enjoy some unusual sights, such as the new High Roller Ferris Wheel that is currently under construction. At 550 feet tall and with a wheel diameter of 520 feet the High Roller will become the world’s tallest operational Ferris wheel when it goes online. 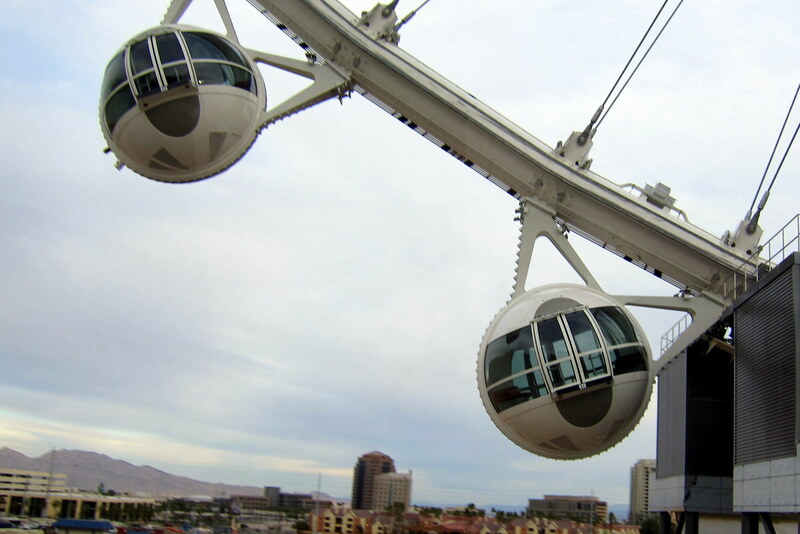 A $30.00 ticket will provide a half hour ride in one of 28 transparent spherical self-leveling passenger cabins. Each cabin is 22 feet in diameter and capable of carrying up to 40 folks. 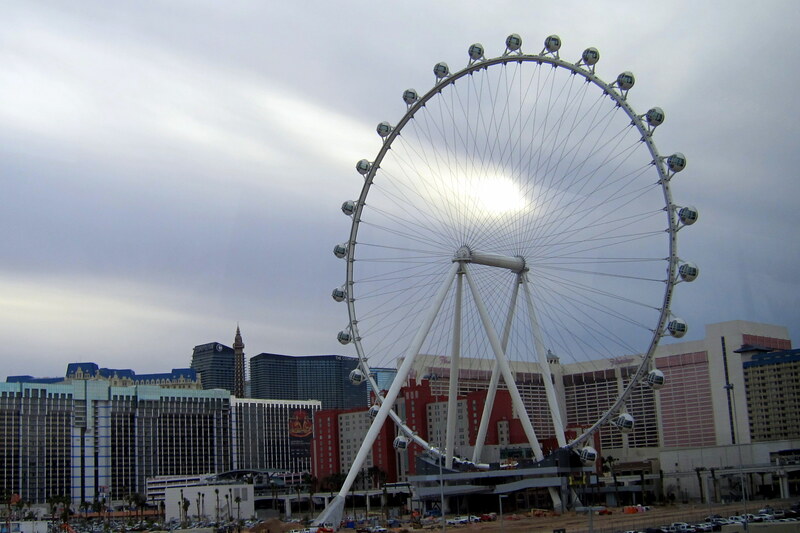 The High Roller is scheduled to open next month…..too bad we will be long gone by them. Oh well, there’s always next year! 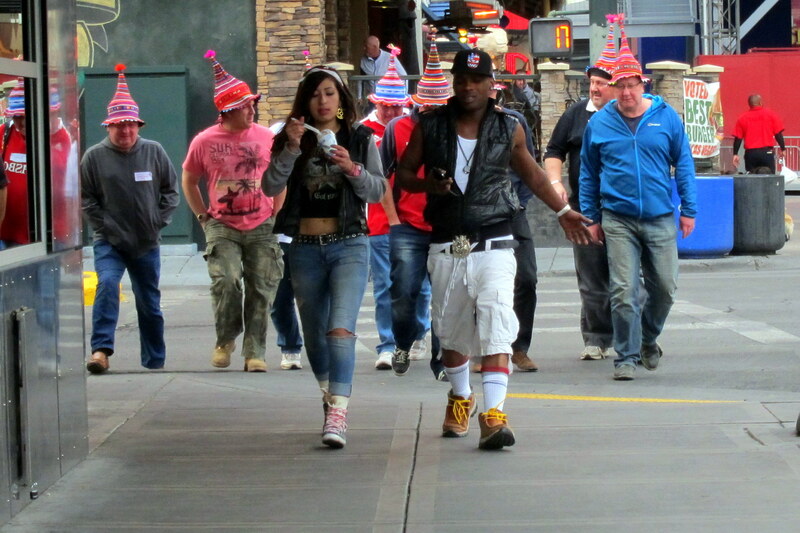 Las Vegas is a great people watching venue as folks from all over the world blend in with the homeys….as evident by the photo below. Yea, I don’t know what’s going on here either…..maybe I should run a “Caption Contest” for this photo? 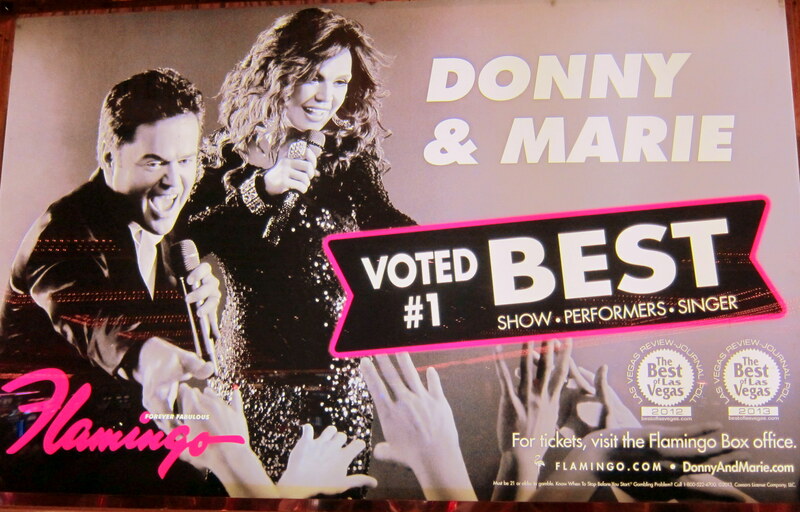 One of the items on Kit’s Bucket List is to see the Donny and Marie Show at the Flamingo. Last year we had tickets but the show was cancelled just hours before the performance was scheduled to begin……Kit was some disappointed. So the first stop on today’s Las Vegas Strip adventure was the Flamingo Box Office. Yep they are definitely on for tonight and some very nice, albeit pricey, seats were still available so we snapped up two of them. Now, I’m not much of a Donny and Marie Osmond fan, in fact I was listening to the Beatles, Beach Boys and Rolling Stones when The Osmond’s were popular. 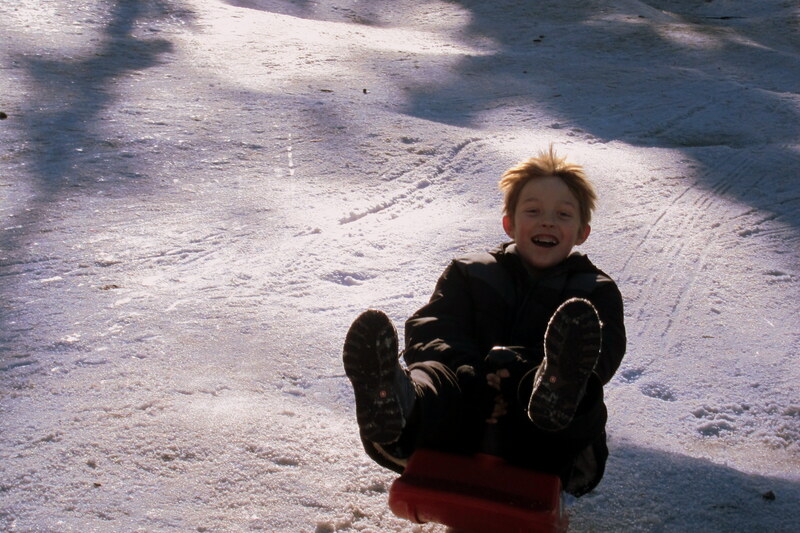 However, I decided to grin and bear it for Kit’s sake. Besides she has been a real trooper accompanying me on my bucket list adventures. Turns out, I found the show to be thoroughly entertaining. The high octane music and dance numbers were unbelievable and our third row seats were perfectly situated to view the performance. I thoroughly enjoyed watching Donny and Marie sing and didn’t want them to leave the stage…..what fantastic voices! There is definitely a reason this show recently won the Las Vegas Journal Readers Poll! Kit and I highly recommend the Donny and Marie show to anyone visiting Las Vegas!! Still on a high we poured out onto Las Vegas Boulevard and mingled with the visiting tourists and conventioneers. Walking down the strip, I noticed this truck moving slowly down the boulevard. It appears that box truck is loaded with girls that want to meet me, or so the sign sez. Apparently they assume I am a swimming instructor as they appear to be wearing their swimwear…..boy, are they gonna be disappointed! After milling about Las Vegas Boulevard for a few hours we rode The Monorail back to the MGM Grand and had a late (very late for us) meal and a few drinks at Wolfgang Pucks. I enjoyed a local craft beer and Kit had some wine chased by the glass of Vodka you see on the table. We also shared one of Wolfgang’s Puck’s…..you may notice it half consumed on the elevated tray in the center of the table. Way too long after midnight, we slithered into the truck and made our way through a mostly deserted North Las Vegas back to our little camper. What a fantastic day! There are always items of interest we stumble upon that don’t quite fit the journal’s narrative so I generally add them at the end…..following is this week’s crop. First, a rather unique amphibious vehicle seen downtown. 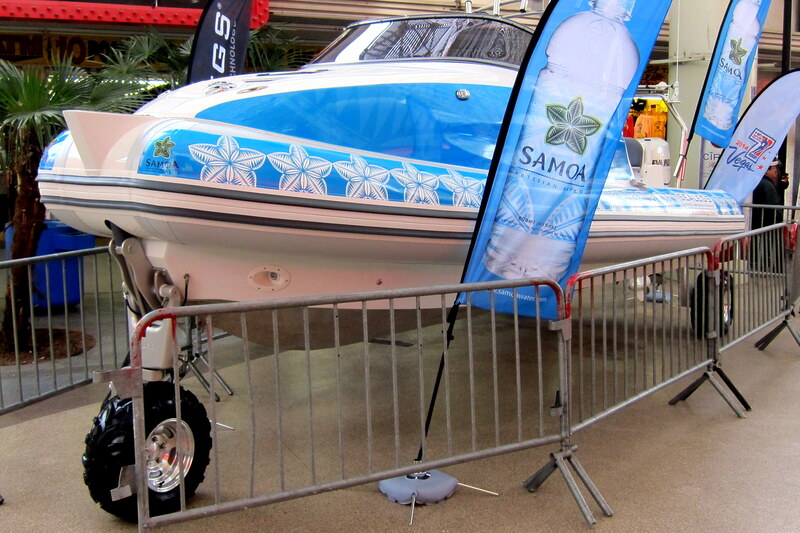 It was manufactured by the Sealegs Corporation of Auckland, New Zealand as a promotion for Samoa bottled water. Living in Maine, this would be a neat toy to own, and with those tires I bet it handles the snow just fine. 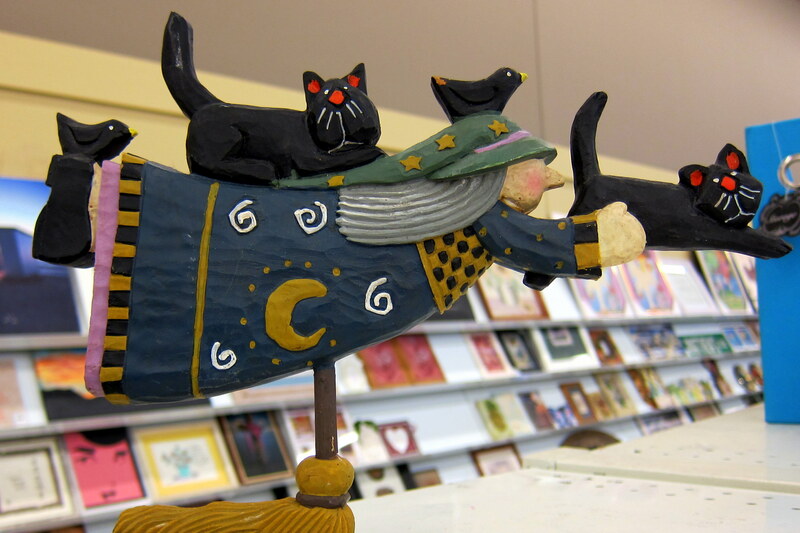 Next is a weird sculpture I noticed in a Savers Thrift Store. I’m guessing it was an ill-conceived souvenir at one point. Gee, I wonder why it was donated rather than put on prominent display in someone’s home and you just gotta love the expression on the face of the lead cat. Well, this closes the report on what happened with us this week…..and the next journal will sadly conclude our stay in Las Vegas for this year. Kit’s Bits: First of all, I’m not too fond of those advertising trucks cruising “The Strip”, however, in this town, it’s a fact of life. We’ve enjoyed our time here and we’re sad to be leaving. Having the grandkids stay with us every weekend for almost 6 weeks has been quite a treat! They’ve come to know our routine and look forward to our Mystery Rides. Pop always has something special for them up his sleeve, even if it’s just empty boxes to play with. We’re glad to be able to spend this time with them. We have thoroughly enjoyed our stay here this year. I called the number on the back of the truck and they answered “Hi Bill”. I gotta stop giving you my business cards! So pleased that you have been able to spend some quality time with those grandkids…time slips away from us relentlessly, and soon they will have grown to have other interests. We are really impressed with the many entertainment possibilities you have found at Las Vegas area. Travel safe! Looking forward to your next chapter! Verna Lagasse Thoroughly enjoy reading about your travels. The photographs are just beautiful!!!! You can imagine how jealous I am that you got to see Donny and Marie. BUT, you would so thoughtful to get me that shirt and magnet that I forgive you! Glad you are having such a wonderful trip!! !